When an afternoon errand found me and my mother at Bonifacio High Street, I figured it was high time to try out Chelsea Market Cafe. In an effort to stay true to the market part of its name, Chelsea has a couple of refrigerated displays with cheese and cold cuts, as well as some shelves of cookies, drinks (ohai, Bundaberg!) and even some cooking implements. We came at an odd time. Too late for a late lunch, too early for an early dinner. Merienda would be the best description, but not having eaten lunch yet, a light snack wouldn’t have cut it. A tent card advertising a 2:30 to 5:30 pm special caught my eye. 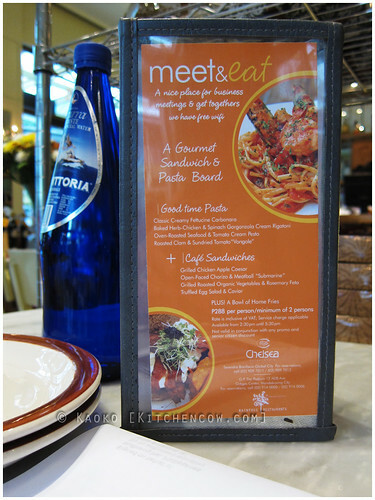 Called Meet & Eat, the promotion offered half a sandwich and half a serving of pasta for P288 per person. Catch was, you had to have at least two people in your party ordering the same thing. Doing the math, it came out cheap, while the interesting pasta and sandwich choices made it sound like a good choice. We opted to get the Roasted Clam and Sundried Tomato “Vongole” (yes, I know, it’s like saying Pizza Pie) and the Truffled Egg Salad and Caviar. The pasta was quite good. Cooked al dente and lightly coated with a cream-based sauce, it was rich and flavorful without being too heavy. The clams were fresh and succulent. A splash of lemon stopped the cream from being cloying while the sundried tomatoes offering a sharpness that complemented the sauce well. Moving on to the sandwich, there is no way to describe it but as intense. The first bite offered a strong hit of truffle that screams TRUFFLES! I appreciated it, initially. I like truffles. But with wave after wave of intense flavor assailing my tastebuds, I found myself stopping midway because of too much truffles. Heck, hours later, my brain was still going, “TRUFFLES!” I wonder if this is how truffle-hunting pigs feel like. 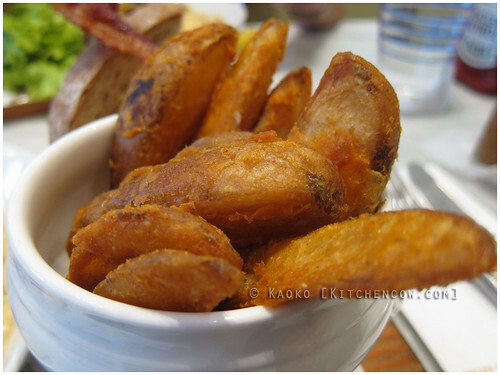 Aside from our pasta and sandwiches, we were also served a bowl of some wonderfully crisped potato wedges and a small salad drizzled with a vinaigrette. Honestly though, we had a hard time finishing everything because the servings were quite big. 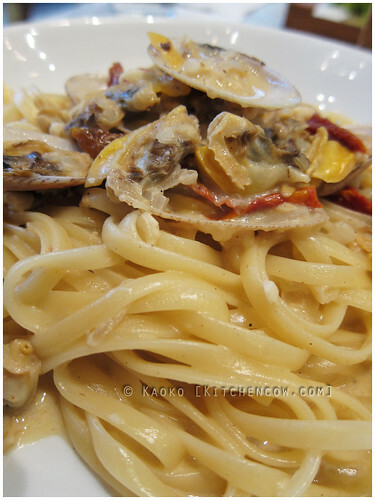 The pasta and half-sandwich can probably pass as full-sized servings in other restaurants. 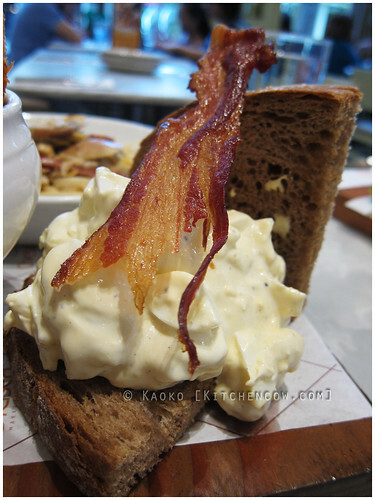 While Chelsea Market Cafe may seem a bit more upscale than your usual cafe, the servings are generous and they don’t skimp on the ingredients. I daresay it’s worth a few more visits just to try the other dishes on the menu. I’ll just be sure to skip the truffles next time. hey! haven’t visited your blog in a long while. i super duper love chelsea! yes, been busy but never too busy to eat! if you happen to be in qc, let’s eat at nomama! it’s right across my office. i wanna try their ramen! I’ve heard about them, but it’s oh so far! It was! It was such a pity that I wasn’t able to finish it though. Serving was too big for me, especially since I still had half a sandwich.